When we first explored the plan to bring the Kids Up Front program to Ottawa, there were several groups we felt we could truly rely on to share our excitement. Recognizing the intrinsic value of our program, the Ottawa Community Foundation answered our call, and has rallied behind Kids Up Front in a very meaningful way. The Foundation has supported our program since our first tickets were distributed in April 2017, by providing important seed dollars and believing in our strategy to bring the program from concept to reality in Ottawa. There are certain events from your childhood that you will always cherish. Remember the feeling of pure excitement when you attended your first NHL game? Or the adrenaline rush you felt going down a ski hill for the first time, or that sense of awe you felt at your first concert? For many families in Ottawa, these are experiences they just can’t afford to give their children. Kids Up Front is creating these opportunities for Ottawa families by redistributing unused event tickets so that deserving children and their families have access to the stimulating worlds of art, culture and sports. By partnering with child-serving agencies around the city, Kids Up Front is able to identify and connect deserving children to the unused tickets. In 2017, The Ottawa Community Foundation (OCF) granted $10,000 to the charitable organization to help them bring their concept to the Ottawa market and support an initiative that provides youth with positive experiences in their community, but that can also be life-changing and provide life-long memories. With key partners and core funding in place, Kids Up Front was able to begin operations. Once they established a good network of local business and child-serving organizations, they were able to begin redistributing tickets donated by their partners. On April 2, 2017, Kids Up Front redistributed their first pair of tickets to a young girl to attend the Juno Awards. Kids Up Front has redistributed tickets for numerous events such as Bluesfest, Comic-Con, and countless Ottawa Senators’ games. While some community partners have donated tickets, others have waived admission fees or provided bus transportation to and from events. Since their launch in the spring of 2017, Kids Up Front has redistributed over 5,000 tickets and has partnered with 53 child-serving agencies in the Ottawa area. 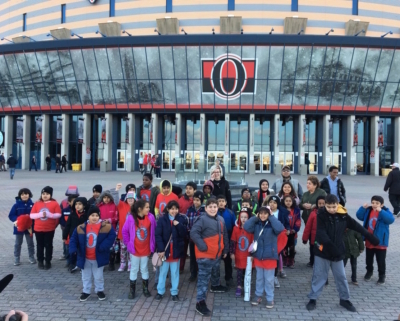 In celebration of the one-year anniversary, they redistributed 40 tickets to local youth from Ottawa Community Housing to watch the Ottawa Senators play their last home game of the season on April 2, 2018. With a successful first year, Evan has big plans for the future. “Our goal for next year is to focus on growth,” explains Evan. He hopes to increase public awareness of the organization, strengthen and grow the network of child-serving agencies, volunteers and the number of experiences donated. Kids Up Front was founded 1999 and has since redistributed over 1 million tickets to children, youth across Canada. They have chapters in Calgary, Edmonton, Vancouver, Toronto, Ottawa and most recently Halifax. For more information or to see how you can get involved with Kids Up Front visit http://kidsupfront.com. PreviousPrevious post:Ski Day Success!NextNext post:Summer is Back!